I’ve recently returned from the 2016 Health Datapalooza conference, where dozens of commercial insurers, public payers and providers talked about how they’re restructuring payments to be based on values and successful outcomes. While value-based contracting is not being implemented as quickly in the behavioral health and addiction treatment worlds as in the physical health arena, it is absolutely clear that substance abuse treatment payment models are going to change drastically in the next few years. Perhaps the biggest change will be driven by the introduction of Accountable Care Organizations (ACOs). Over 800 public and private ACOs have been formed in all 50 states, and today almost 20% of insured Americans receive their health services through ACOs. Because these organizations keep the savings if they are able to provide high-quality care for less than the agreed price per individual, ACOs are heavily motivated to identify and contract with behavioral health and addiction treatment facilities who can prove they have excellent long-term outcomes. The shift to value-based payments represents both a strategic opportunity and a strategic threat to behavioral health care providers. If you can prove you’re really good at treating a certain type of patient, payers will be eager to partner with you. However, the strategic threat is just as real -- you can be cut out of certain markets if a competitor succeeds in building a preferential relationship with a payer and you don’t. In fact, one Health Datapalooza speaker went as far as to predict that the market is going to change so drastically in the next five years that the current crop of addiction treatment centers will all go out of business. It is imperative that we prove him wrong. But doing so is going to require a major cultural transformation to make performance management a core competency of all addiction treatment programs. 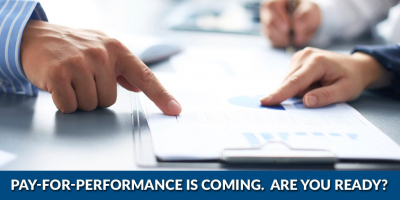 Not only does your executive team need the ability to generate the right data, but your organization must actually use that data to hit the required performance standards. We’re here to help. Vista’s Progress Monitoring research gives you the data you need to optimize treatment for your patients. INSIGHT Addiction and INSIGHT Behavioral screen patients for depression, anxiety, trauma, eating disorders, suicidal thoughts and self-harming behavior, and track the severity of their symptoms throughout the time they’re in treatment. INSIGHT also monitors other indicators of pending relapse such as cravings and satisfaction with treatment. We summarize this patient-provided data in easy-to-read graphs so your clinicians can use it to inform clinical care, and we do so very inexpensively. In addition, we periodically aggregate your data in comprehensive reports so you can track how your patients have been improving during treatment. As helpful as this data is, you’ll also need post-treatment outcomes data to take full advantage of the coming pay-for-performance opportunities. Vista’s RECOVERY 20/20 outcomes research follows up with your previous patients one month, six months and twelve months after they leave treatment to learn whether they’ve been able to abstain from drugs and alcohol since treatment and to learn the current severity of any co-occurring disorders they are struggling with. We also ask various quality of life questions, arming you with critical data such as whether they’ve been hospitalized, arrested, jailed, or enrolled in another treatment program since leaving your program, and how treatment has impacted their housing, employment, physical health, emotional health and the quality of their relationships. If you want to be in a position to take advantage of pay-for-performance opportunities in the future, you need to start generating the necessary data now. Remember, it may well take two full years to generate 12-month follow-up data on enough patients to allow you to comfortably commit to achieving specific outcomes in the future. If you’re interested in learning about how Vista’s programs can help you thrive in the coming value-based world, please join us for our next webinar "Using Patient-Reported Data to Improve Treatment Results & Your Bottom Line" .